I hope everyone had a nice Christmas and general holiday season. I love Christmas, but with a toddler, this year it was slightly stressful for me. We managed to only have a few ornament casualties and we didn’t put out presents until the evening of Christmas Eve. 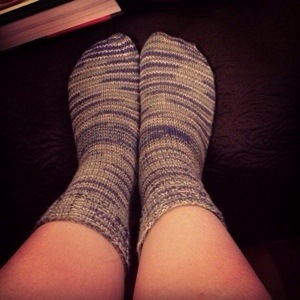 I finally finished knitting the second sock in the pair I was knitting. All that’s left is weaving ends. I think I may have to do that today. I haven’t been doing much other knitting lately because I have been letting life get in the way. Honestly my stress levels go up drastically when I don’t knit that it makes me not feel like knitting and then we end up in this vicious cycle that sadly doesn’t involve knitting. No worries, I have several projects being planned out right now. I did start knitting on the Bethel Woods Cardigan for mg hubby again this week. I am still not completely sure that I am comfortable with this while uneven number of stitches in a 2X2 rib, but whatever. I am hoping that I don’t end up with some weird seam trying to hide extra columns of stitches. The Lionbrand site says that the pattern is completely up to date and I haven’t found any other posts of people having an issue, so either they are making a different size that has even numbers of stitches or I’m just crazy. I’ll knit it like the pattern says but I am not going to like it! Lol! If I get it finished and it looks funky, I’m ripping it out and knitting it in one piece. I’ll update more on that as I make more progress. Hopefully it won’t involve ripping things out. I am wanting to start spinning more, but I am running into issues with my wheel and children. I still haven’t fixed my wheel from the last time my child broke it (no permanent damage, just loosened the nut holding the actual part that turns the wheel) and now I watch another child during the day, so I can’t always be in one room and I don’t trust either of them near it, even though she is older. Right now it is hidden in my storage closet which the kids aren’t allowed to get in to. It makes me so sad to have it locked away, but I don’t want it broken more permanently. I need to work on my schedule so that I can work more on things that I want to work on. Speaking on scheduling, I am spending a lot of my time trying to learn a new skill (non fiber arts related). I’m one of those people who want to do it all, but I have had to sit down and look at life realistically. If something were to happen to my husband or he decided that he wanted to retire one day, I’m not in a very good position to jump into a career. I don’t have a ton of formal schooling and while I have a lot of experience in data entry and customer service, It isn’t my first choice of ways to spend my life. I’d love to write, but I don’t think I have the drive to do that, at least not at this point in my life, although I will always write. It’s what I do. By the way, my blog should not be any indication of my writing style! Lol! So what I am trying to say is that my spare time is being pulled yet another direction, as I am doing a ton of independent studying right now. I am not planning on quitting knitting or blogging, but my progress and posts probably won’t likely be as often as I’d like. Who knows. Maybe I will surprise myself! 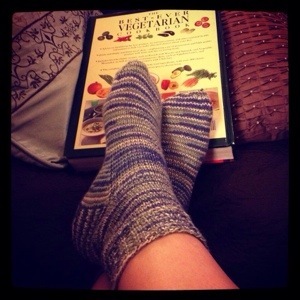 Now since today is Saturday, I am going to spend most of the day laying around knitting, so I better get to it! I almost completed the Sidelines Top. By almost I mean that all of the pieces are knit, everything is seamed, and all ends woven. It is 99% done. All that is left is the edgings. 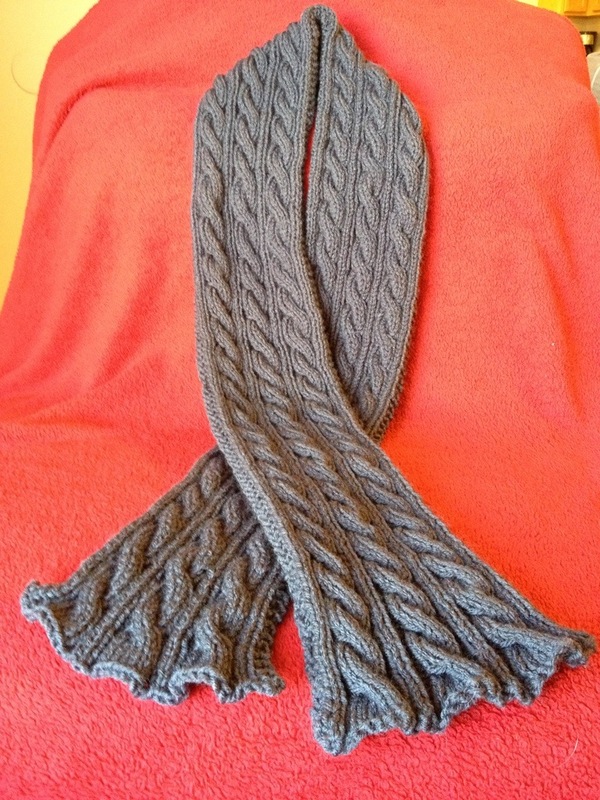 The pattern calls for a reverse single crochet edging around the arms, neckline, and bottom edge. I don’t like it. 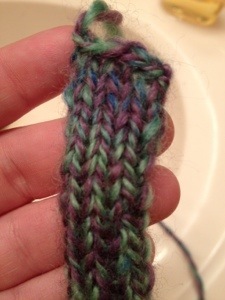 I think it looks sloppy but it needs something to keep the edges from rolling because of the stockinette stitch. 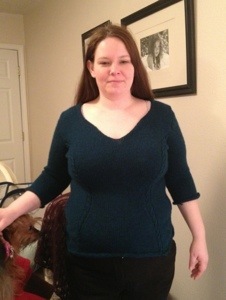 Also the neckline is just a tad wide for me and I was hoping that the edging would make up for the wide neck. Reverse single crochet does not do that for me. Seeing as how it is now warming up and I won’t have a whole lot of opportunity to wear the sweater this year so I am calling it good enough for now. I am on the lookout for a different edging, but I am not going to put a lot of time into it for now. Since I have one project done (for now) I am going to start working on my Queen Anne’s lace shawl again. I have missed lace. Hmm… Maybe I should do a lace edging on the sweater… Anyway I pulled out my pattern again this evening and I will be working on it soon. I also have decided that I need to have my wheel back with me. I’ve missed it. I don’t have a whole lot of time for spinning, but now that I am a Domestic Goddess, I have the ability to make time. 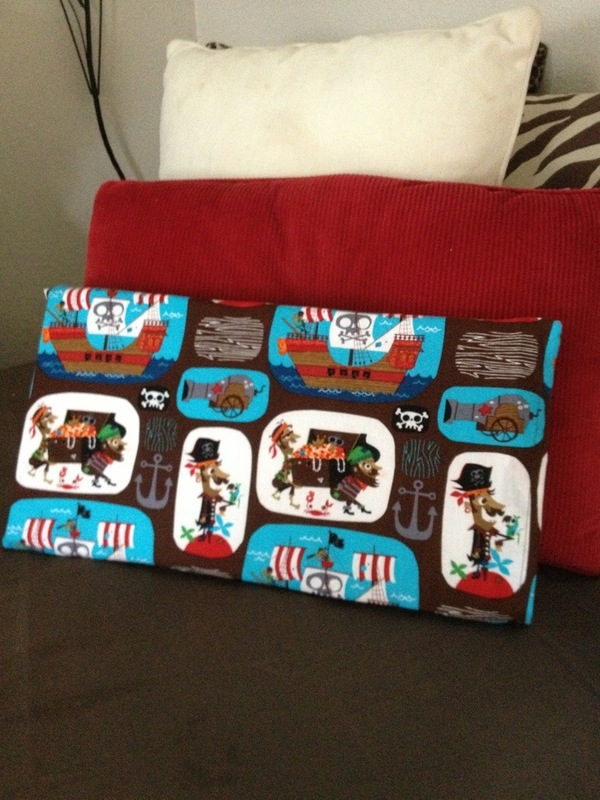 I am going to have to clear a spot in the closet for toddler safe storage, but I need it with me. It just occurred to me that in the last year, I have only completed something like three or four projects. I don’t like that. I plan on doing more knitting this year. It’s my passion and I should make more time for it. So hopefully I will have more to blog about in the near future! For now I have an almost finished picture! I have been knitting on the Irish Hiking Scarf for at least since the beginning of the year, so it took me about 23 days to finish. I’ll spare the math on how many actual minutes it took me to complete and what the rate of knitting was but really that is more because I don’t know the actual row count/length of the scarf and I’m really sleepy so math would be bad now. 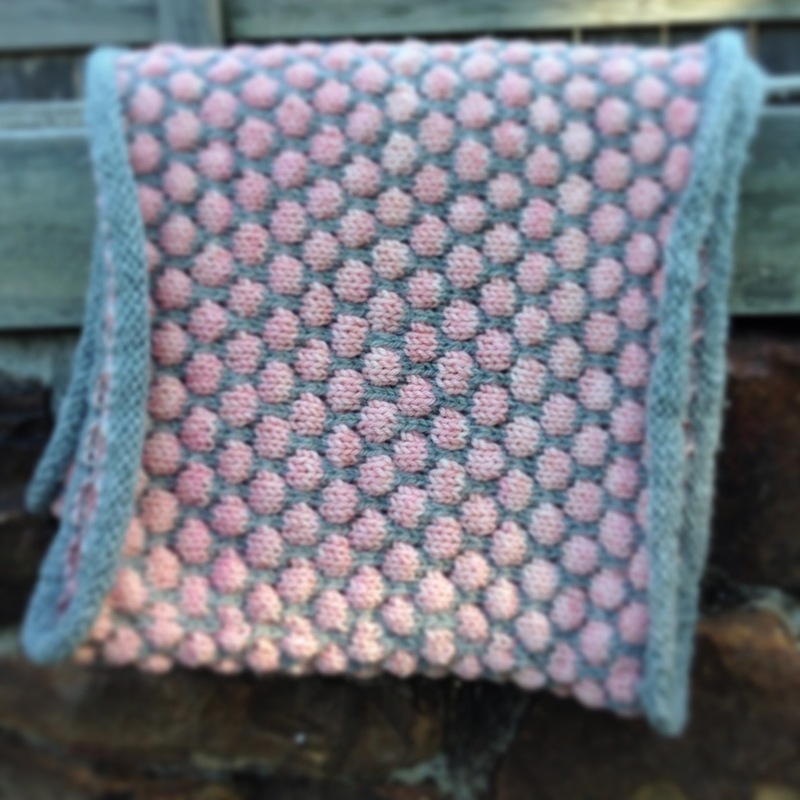 Instead, I will post a lovely finished object picture and call it a night! Happy knitting!